I’ve heard from a lot of people that they find the idea of doing a bust adjustment on princess seams horrifying. 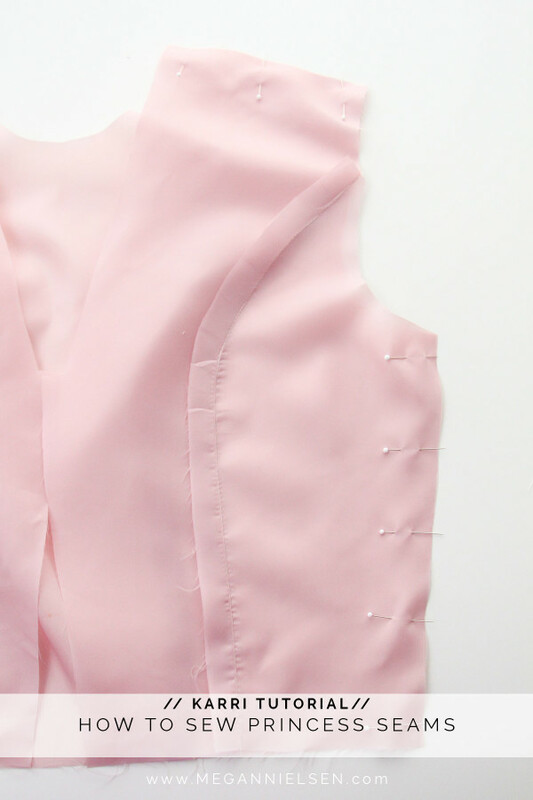 Honestly, it’s actually not that different than doing a bust adjustment on a darted bodice – but personally, i feel like you get a smoother end fit with princess seams. 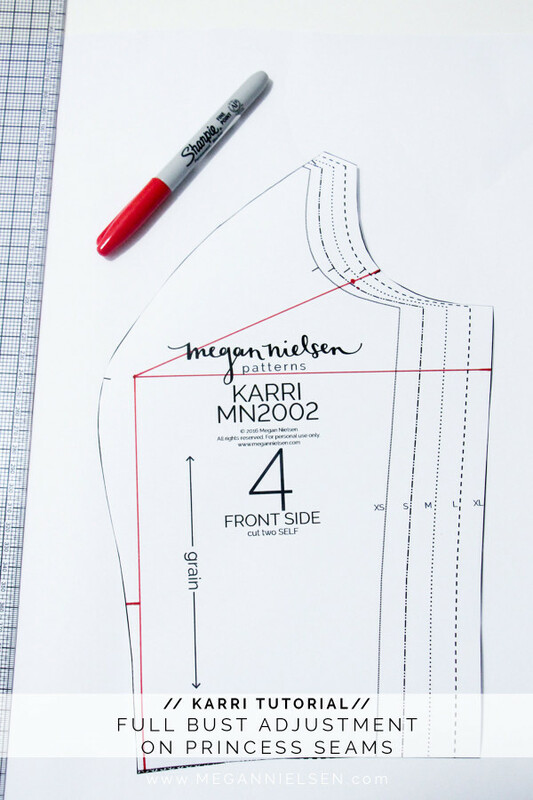 With the release of my new Karri dress, I knew many of you would be wondering how to tackle this adjustment, and also whether in fact you actually need one. But never fear! You can do it, i promise. Here’s the deal. Most patterns are drafted for a B cup. I know that’s probably upsetting those of you who aren’t B cups, but the unfortunate truth is that patterns need to be drafted to some sort of base standard, and most pattern companies (like mine) draft for a B cup. What does this mean for people who aren’t B cups? 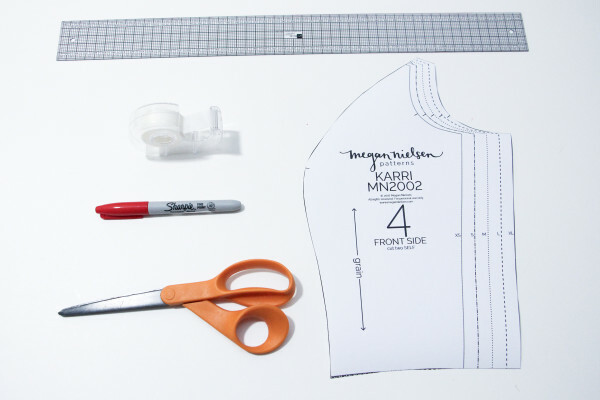 Well, you’ll probably need to alter your pattern to get the right fit over your bust. 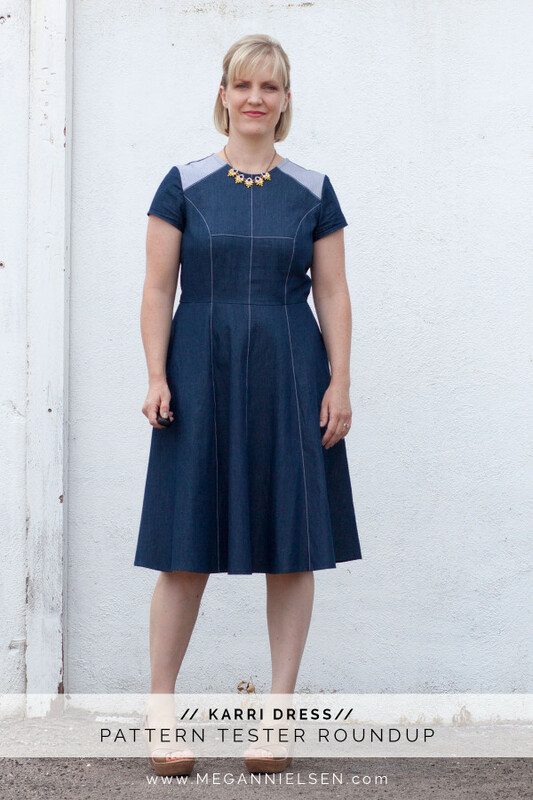 Well my dears, I am SUPER excited to introduce you to my newest pattern, the Karri dress! It has been so hard keeping quite about this new pattern, because I love it so very much. It’s going to be hard not to write this whole post in all caps lock… deep breath. Karri is a multi paneled dress with distinctive style lines and close fit. The pattern features princess seams, flared skirt, anchored side seam pockets, short sleeves, centre back invisible zipper and a full lining. It’s designed to be made from a single fabric or multiple fabrics for a striking effect. Pattern designs come about in different ways, but Karri had kind of a special evolution. I have so many scraps of precious fabric that i have been desperately hoarding in my stash. Those little pieces that can’t be used for an entire garment, but are big enough that it feels wasteful to get rid of them. You know what i mean right? I really didn’t want to throw them away but never quite found the right project to use them in. You just don’t throw away Liberty! It got me thinking, what if I could design a dress that could be made from small pieces of co-ordinating fabric. That’s how the idea of Karri was born. 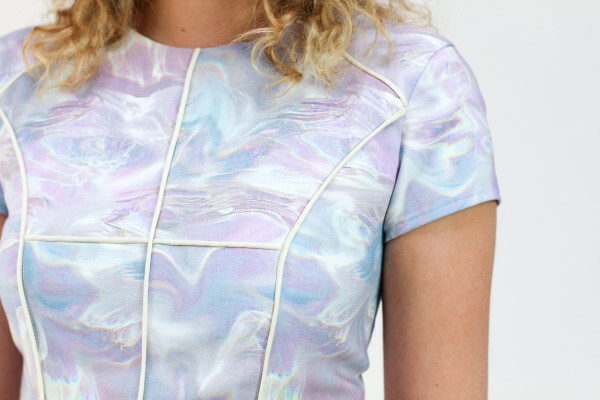 Every pattern piece of the Karri dress is relatively small, and can be easily made from any number of different pieces of material to create your own unique design. Of course, Karri can also be made from a single piece of fabric for an equally striking look with wonderful clean lines. There’s so much fun to be had with this pattern, and with the holidays so close now, this dress is a really great choice for your special events *wink wink*. In the samples for this pattern I wanted to show you a number of different ways that you can use the pattern. The first sample is made from one fabric, and has been lovingly nick named the “Paddle Pop dress” in the office because it reminds us of the Aussie kids icecream hehe. For this sample i used a contrast piping in the seams to really let the style lines take centre stage. This sample is dressier than the others, and is perfect for a function or night out. The fabric is from a local store called Potter Textiles, if you’re in Perth I know they still have this fabric in stock. Quilting cotton with pattern piece design previously used in last years Sewcial sewing gathering outfit. Dark cotton chambray from my Reef pattern samples. Light blue cotton chambray from my Darling Ranges V1 sample. Dark grey cotton chambray from my Darling Ranges V3 sample. Dark denim from the Brumby skirt V1 sample. Super light blue chambray left over from a dress in my old ready to wear collections (yes i hoard for a long time). 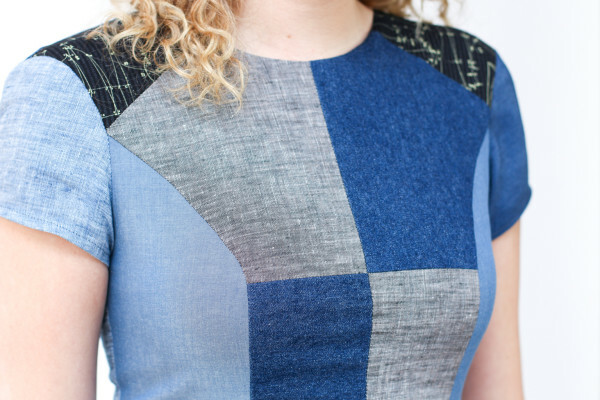 Blue linen from a peplum blouse i made myself (which i haven’t blogged… oops… bad blogger). You guys that’s a lot of scraps! All these pieces wouldn’t have found another use, but now they’re a really special and completely unique dress! The last sample is an idea from my sisters in law. I wanted to include a sample that was more appropriate for the office, and showed a slightly different way to use those panels. This dress is made from cotton voile double cloth – it’s a really cool fabric that I blogged about here and also used for a Cascade skirt sample. One side is grey and one is black, so based on some very good tips, I chose to make the side and shoulder panels black, and the centre panels and sleeves all grey. I love how this turned out! Though i really intended this to be the “corporate” look of the samples, i feel like this is equally an evening look too. We’ll also be posting links to past tutorials that include techniques that apply to Karri to make sure you have as much help as possible. 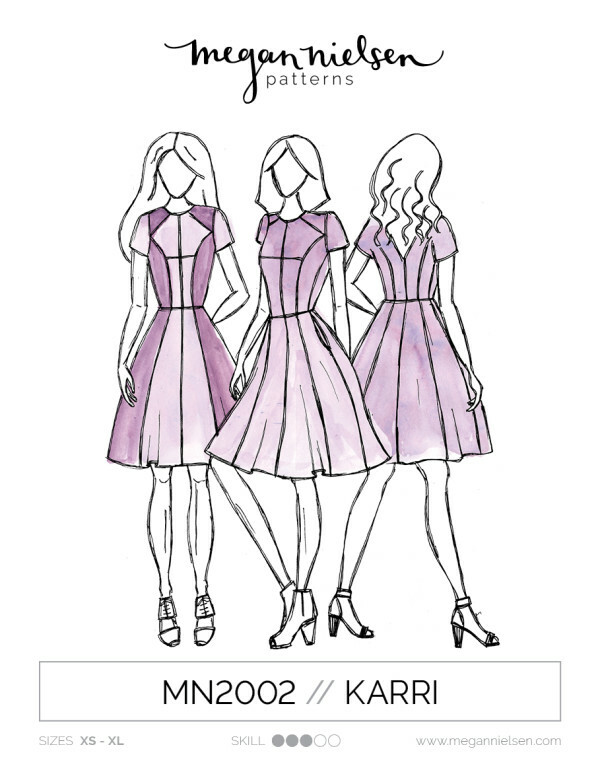 Oh and did I mention we are even including a little colouring in sheet in this pattern to help you plan out your own unique Karri dress! It’s a free download on our site, and should be available to you directly after purchase, whether you purchase a printed or PDF version of the pattern. 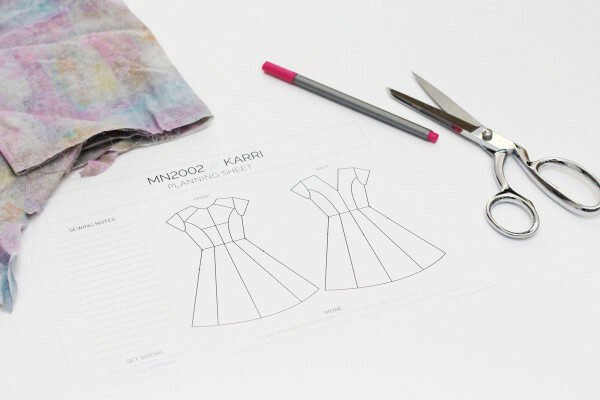 You can print it off as many times as you need to help you plan out your own unique Karri design. I can’t wait to share the pattern tester makes with you as they are just so gorgeous! I hope you love this pattern as much as we do! We would love to see your Karri’s so don’t forget to tag #MNkarri and @megannielsenpatterns when sharing your makes on Instagram. As always please let me know if you have any questions in the comments below!